2019 NBA Mock Draft #4 : Is talent superior to need? Porzingis is not and will never be a center and NY already has a solid rim protector prospect with Mitchell Robinson. If the Knicks don’t take Zion, they have to go with Morant. The Murray State leader has a mix of athleticism and passing which makes him a tantalizing prospect, as evidenced by some of his statlines, albeit against poor opponents (26pts 28as vs UT Martin, 40pts 11as vs SIE Edwardsville). Turnovers and shooting consistency are still issues but his 9/21 from three over the last three games and 21/21 from the FT line against SIU are positive signs. 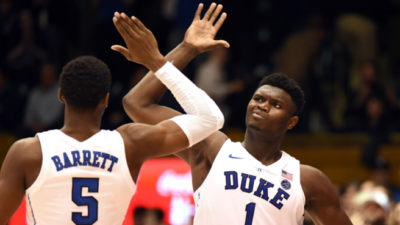 It may seem low to put Zion at the third spot but despite his incredible season, there are still question marks about him. First of all, he’s nothing but a four so the fact that Love and Porzingis are the leaders of the potential first two picking teams is a problem for Zion. Then, as efficient as he is, Zion has not particularly expanded his range, shooting only 27% from three with few attempts. Yet, Like Barrett, he had some amazing perfs like his 25pts 7rbds 7as against Pittsburgh or 30pts 10rbds 4as on 6/4 from three against Wake Forest, enough to make any team decide he’s their future. After his 23pts perf and buzzer beater against FSU, we thought Reddish was finally on…well, since then, he has shot only 20% from the field and his last game is a good example of Reddish can do well or bad with 7pts on 1/11 from the field but 6rbds 6as 5st!! As talented as he is, Reddish has to bring it all every night. If he can, he will be a top swingman in the league, if not, he would be a disappointment. Bol Bol has already made his decision to enter the draft. He has not disappointed as he’s easily made the transition to college basketball while displaying his incredible versatility. Despite his block numbers, Bol could be a better on on one defender by gaining strength. Yet, for such a tall player, he has tremendous agility and keeps knocking shots from outside (12/20 over his last six games). A perfect fit alongside John Collins. After Bol, a lot will depend of each team’s scouting and needs. Memphis has selected a solid inside prospect with JJJ last year, it may go with the best outside player. Among the talented crop of guards, NAW has two major strengths, the ability to play the point like his cousin SGA, albeit having to be paired with a Bradley/Beverley type of defensive guard, and the ability to shot consistently from three contrary to Langford or Culver. He has struggled more during the last games with two 4pts perf but still possesses more appeal than the other guards. Orlando may use the trade period to go all tanking and try to grab some assets for Vucevic and Fournier, two solid team players who may not fit the athletic style of Gordon, Bamba or Isaac. With a notable lack of PGs, the Magic may take the best backcourt available and the most athletic one. Porter has been injured and then suspended but he has finally come back (14pts on 3/7 from three in 18min vs Arizona but 0pt vs Arizona State in 10min) and could be another spectacular player for the Magic. Bassey is underrated by many experts but he’s been good right after reclassifying. A very good rebounder (17rbds in two of his last three games) and shot blocker, Bassey has also displayed the ability yo shoot from outside, albeit on a low volume (8/15). He could be nice solution to compete with Thomas Bryant for the starting spot at the center position. With the starting five set at both backcourt positions and at PF, the Hawks would need a SF if they select Bol at 5. After struggling in the first half of the season, Little is showing game by game why he was a top five recruit out of high school. In his three last games, he’s averaged 15.3pts in only 17min including 23pts 6rbds 3as on 2/3 from three against Virginia Tech. Atlanta would be lucky if they could pick Little at 9. Detroit lacks talent at both SG and SF positions. A versatile player and very good rebounder, Culver could be bring more toughness than Bullock at the SG position. He needs to work on his consistency from outside as he shot only 3/13 over the three consecutive losses of Texas Tech but with several 10+rbds and 5+as games. Nicolas who? A sophomore, Claxton has nice athletic and physical tools to go with an improving outside shot and surprising versatility as a former forward. As Gibson is aging and the Wolves need to improve their defense, the Georgia prospect could learn from Towns on offense and bring much needed rim protection while improving his strength and efficiency. NOP needs to adress their main issue at the SF spot. Some experts prefer Hunter. I decided to go with Hachimura, who has been put mainly at the four spot and still has a lot of room to improve. Moreover, he has an interesting financial value as he will allow his franchise to enter the 126m people Japanese market, a non negligeable aspect for the team drafting him. Out of high school, Langford had star potential written all over him. The Hoosier, who was productive despite his bad shooting until recently, has hit a wall with 10.8pts over his last four games with a combined 14/46 from the floor… right after his best scoring game against Maryland with 28pts including 3/6 from three. He still is a talented guard with major potential who needs to work on his consistency and improve his overall strength and athleticism. The Lakers need shooters alongside Ball and Ingram (if none of them is traded before the draft). Johnson is a tough minded power guard with a nice shooting stroke. He’s not the most versatile offensive player but there’s no questions about his motor as he displayed it in the win against Kansas with 15pts 10rbds on 6/4 from three. What does the Heat need more? With the aging dragic injured once again, the Heat will have to find another option as they don’t even have a back up PG. If Garland comes back healthy before the draft process, he could be that PG. The Hornets need talent at both inside position. In a draft lacking major PF prospects, Charlotte could go European and select Bitadze. After playing for Mega Leks in Serbia, Bitadze has been sent to Buducnost Pogdorica in Montenegro whre he has started his Euroleague career successfully. His 7.4rbds and 3.2bl in only 25min in the second best competition in the world are proving he can be a dominant center in the NBA and deserves far more respect from scouts. A potential steal even at 16. Hunter’s defense and outside offense are more than appreciated by experts despite his low volume shooting. He is at his best in Virginia’s team plan and would ne a nice fit as a 3 and D for the Nets. Second pick for the Celtics or the team which would get the pick, Jaxson Hayes. The Texas freshman, like former Longhorn Jarrett Allen, is a tremendous athlete with length and shot blocking ability. He still has to work on his basketball IQ but has been an incredible finisher with 75% from the floor and a solid 70% from the FT line. Allen’s sucess with Brooklyn should help him get picked in the late lottery/mid first round. Injured for several weeks, Doumbouya is a raw prospect who needs to work on basically everything from his shooting to his defense and ball handling. Yet, he has tremendous upside and the ability to become a versatile combo forward. He shares with Gobert the same agent, a good sign for Utah who needs a stretch four alongside their rim protector. An incredibly long and athletic center, Gafford could bring much needed rim protection to the Spurs and learn on offense from one of the best low post specialist, Aldridge. He has been less efficient recently despite his 32pts perf against LSU. Before his injury, Porter was projected as a top 10 prospect. We don’t know if he will be healthy entering the draft process but his mix of size, shot blocking and shooting would be hard to pass on in that late in the first round. Houston has solid inside players with Capela and now Faried but lacks an outside shooting big. Okpala combines good physical tools with nice outside shooting. He has been very good recently with four games in a row with 21pts or more despite a weak 5/14 from three. He could be a nice addition for the Blazers and potentially grab that SF starting point filled for the moment by Layman and Harkless. A third pick for the Celtics who, after a guard, a PF and a center, could use the pick to choose Duke’s commander in chief. He’s not the most talked about Blue Devil but has been the catalyzer of Duke’s offense and an extremely poised PG as evidenced by his 2.1st and 5.7as/to ratio. He will never be a top scorer but in a team with multiple offensive threats, his generosity on both ends of the court could make him a fan favourite. Since Saric and Covington left, the Sixers have fewer options at the four spot. Because this draft lacks numerous talented PF, Philly may take a gamble on Washington. The Kentucky sophomore has vastly improved despite playing as many minutes as last year. He’s above all become a better outside shooter and could fit perfectly alongside Embiid. Despite Williams’ reputation for not playing freshmen, White has already become the leader of the Tar Heels as their best passer and second best scorer. His 27pts 7rbds 6as 4st on 5/11 from three against top 10 ranked Virginia Tech were one more display of his ability to rise against top competition. He would be one more versatile player and nice shooter to help OKC in the backcourt. After picking Hunter, the Nets could use the Nuggets pick to select the more talented player available. Reid is a versatile inside player whose rebounding and defense has been quite disappointing. He has been better recently and proved it against Arkansas with 27pts 7rbds on 4/4 from three. An underrated prospect, the Washington State swingman is, like his classmate Porter Jr, a product from the Rainy City. Elleby is as athletic as he is a good shooter, which makes him a high ceiling prospect. He could bring fresh blood from the bench for Indiana, which can only count on Evans and Mc Dermott, solid but limited players. The former Simeon standout has impressive body and athleticism for a guard, which allows him to defend multiple positions. His versatility could be a nice upgrade for the Warriors as he could improve his shooting with some of the best shooters in the league and learn from another do it all swingman from the Chi, Andre Iguodala. After Gafford, the Spurs need versatility and talent, mainly in the frontcourt with Aldridge nearing the end of his career a almost 34. Okeke has not displayed franchise changing potential for now but his mix of athleticism and shooting could make him a special player under the coaching of Pop. In an era of shooting centers, Milwaukee is dominating the NBA with one of the least shooting stars, Giannis. Lopez has been a good find for the Bucks but maybe a pure center coming from the bench to bring even more power could help. Fernando will not wow you with incredible moves but he’s tough and get the job done. He has also become a much better passer with 3as or more in seven of his last eleven games.